* Overwhelming Majority of New Yorkers Supports the Truth Movement! 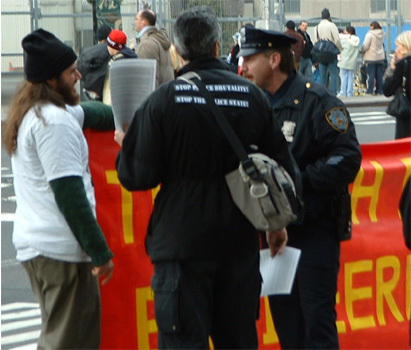 January 4th, 2003 -- ( FTW ) пїЅ The NYC Truth Movement permanently, and completely, took back Ground Zero from the Neo-Conservative false-patriotic agenda today. 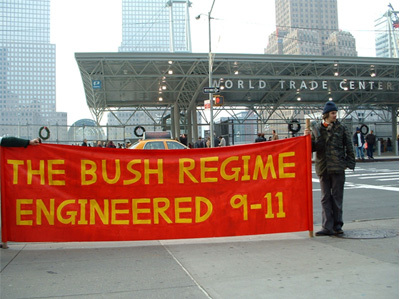 In true New York fashion, 911 Truth activists unveiled the now legendary banner, which read, “THE BUSH REGIME ENGINEERED 9-11” in front of the World Trade Center footprint. At least 20 women over the age of 40, of all ethnic backgrounds said, “God bless you for being here”. Dozens of photos were taken by New Yorkers and tourists from all over the world (oddly enough, including tourists from Saudi Arabia), and people were dying to get our information. 90% of the people were open to hear what we had to say, 9% were not, and less than 1% were very frightened of us so they did what any frightened animal does, bark as loud as they can. Another small percentage of people disagreed with us whole-heartily, but chose to engage us in intelligent dialogue. This included off-duty military personnel, more on that later in this report. But it’s clear, and definitive – New York supports the 9-11 Truth Movement. The NY Truth Movement is calling for an international day of solidarity this Saturday, January 10th. We will be at Ground Zero and by extension, so will you. Make signs and banners of whatever 9-11 Truth message you want to support, and hand out printed educational material. Some handed out the recent, brilliant, New York Press which had 9-11 as the cover story. There were multiple strategies implemented. The diverse opinions of the NY Truth Movement were well reflected. I primarily stuck with what I believe is the most damning evidence of all, the controlled demolition of World Trade Center building 7. 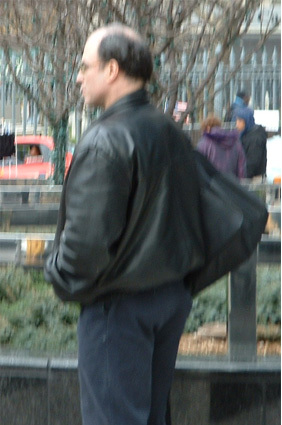 Right at the very start, my fellow activist Jeff Blank was physically grabbed and forced backwards away from the front of the World Trade Center Path Station. He was tossed across the street for merely holding a sign. Jeff is a professional resistor of fascism, he heads the “Stop the Police State Coalition”; Lyn Stewart is his defense attorney. Jeff created our sign, and has been promoting this message in NYC for months. Nico Haupt held the banner with Jeff, and as the police forcibly moved them, Nico briefly grabbed onto a street pole in resistance. I wasn’t there for any of this. I showed up just after the fact as Jeff was in the street yelling, loudly, about free speech and what it means to be free. Very boldly, he compared Bush regime to the German Nazi regime. Police and Military looked on, as Jeff finished what he had to say, scattered applause came from a few who showed early support. illegally grabbing him, but try to trick him – didn’t work. That was the last of the police blatantly subverting our Constitutional Rights to free speech. Officer Collins told us to move our sign because we were “blocking a bus stop” but it was funny, no busses were running. Not to mention that we were more than 10 feet away from the bus stop. In fact, we weren’t blocking the bus stop at all. Some vendors actually were right in front of the bus stop, and they immediately moved once the cops messed with us. Once they moved, the bus stop wasn’t blocked – end of the issue in our eyes. The vendors get hassled regularly even though they have permits. They were very much on our side, and I am personally grateful for their silent solidarity. We weren’t moving, not after they illegally, physically, threw two of us across the street because of their own fear of democracy and free speech. There is nothing illegal about holding a sign in NYC; we were completely within our rights. The police state mentality must be stopped, and will be stopped, by the New York citizens themselves. At one point, two men were visibly upset with the wording of our sign. They asked us directly why we were doing this, and how could we possibly call the Bush administration a “REGIME”? For the most part, I was the one responding to them. I quite simply pointed to the illegal theft of the 2000 election. Plus many in Europe have compared our illegal invasion of Iraq to Germany’s 1939 invasion of Poland. He did not agree completely, though there was much I was saying I could see he did agree with. He said he defends our country everyday so that people like us can do what we do. He clearly stated that we were within our rights, and said with a smile, “Hey man, this is New York!” I couldn’t agree more. After some intense, emotional debate, we came to a point of understanding and respect. His main point was that we were calling HIS BOSS (Bush) a criminal and that reflects on him and other military men and women. I won’t reveal how he defends our country; he shared this with me in such a way that he did not expect it to be reported. I completely understood his impression, and immediately explained that is not the case. We are not, in any way, attacking him and others who defend this country. A Bronx Vet recently told me soldiers in Iraq don’t have the proper vest to stop the caliber of bullets being shot at them. I said, “do you think this guy (Bush) cares about our soldiers? $87 billion and they can’t get our boys the proper vests to save their lives? This guy is no patriot”. Regardless, I will hope for the best, and continue to protest until we get the bulk of this administration subpoenaed, under oath, and in prison where they belong before they have a chance to stage another attack and “delay” the election. William Safire has predicted exactly that will happen as an “October Surprise” before the election. Let us remember, Safire is a political insider, Nixon’s former speechwriter. I don’t think there will be another election if we don’t get these criminals thrown out, so we must get them subpoenaed and in prison ASAP. That is my #1 priority (but hardly my only strategy). Now is the time for everyone to be in the streets and demand the White House be subpoenaed. More strategies are coming to ensure this happens. I don’t know who this guy was, but he was behind us for 2 hours, watching us, with an earpiece for a cell phone on his right ear, talking to someone the entire time. He was not a tourist, he was not interested in anything the vendors were selling, and he just stood there and watched us. When he saw me observing him, he would casually look away. NYC has a homeland security department, but there is no guarantee this guy was a part of that. This wasn’t the only suspicious person lurking around. When I first got there a man came up to me and interrogated me about who ‘we’ were, how often ‘we’ do this, do ‘we’ get harassed often… this guy reeked of being undercover. I don’t know, but considering that we have military armed with automatic rifles in Penn Station, and often in NYC subways, this is highly possible. Manhattan is completely militarized and likely infested with all types of spies. That’s why many in the NY Truth Movement are in complete solidarity with the “Stop the Police State Coalition”, and Frank Morales “Demilitarize the Police Campaign”. plaques meant to be some form of commemoration. 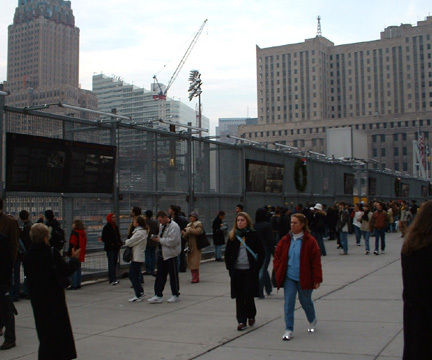 The new path subway station has been erected right where a majority of the 9-11 victims’ remains lay. The Coalition of 9-11 Families request for the Path Train station to be named the “World Trade Center Memorial Station” was completely ignored. That’s just disgusting! One very simple, respectful, decent, compassionate request is completely ignored by Port Authority and New York State. Just pathetic, completely heartless, no empathy, no understanding of what type of loss was experienced on that day. They already ignored much of the Coalition of 9-11 families were promised, and now they can’t even make a very simple, respectful, name change? In my opinion this is very similar to the struggle to properly honor the remains at the African ancestral burial grounds in NYC. At least the 9-11 families don’t have to deal with the 400 years of racism that surrounds African struggle in this country. All they have up in commemoration at Ground Zero are these very average plaques that say much more about the history of the WTC then they do about the victims. In the near future, the NY 9-11 Truth Movement hopes to raise awareness about the plight of the victims’ family members who, in part, feel they have been deceived in their dealings with the State of New York, Port Authority, and the LMDC (Lower Manhattan Development Corporation).